There are 4 types of gap insurance to choose from. Your local Audi Centre can help to work out which level of cover is right for you. Pays the difference between the original purchase price of your Audi and the total loss settlement paid to you by your motor insurer. Pays the difference between any outstanding finance (excluding any arrears) on your Audi and the settlement paid to you by your motor insurer. Combines the advantages of return to invoice price and outstanding finance. Paying the difference between the total loss settlement paid by the motor insurer and the original purchase price or the amount required to settle the finance agreement, whichever is greater. Is for vehicles financed on a hire or lease agreement and pays the difference between the motor insurance payout and the amount required to settle the agreement. If, for example, you purchased a vehicle costing £35,000 and it is written off after 15 months, your motor insurer may only pay out the current market value which might be £30,000. To replace your Audi with another model worth £35,000 you will need to find £5,000. With our ‘Return to invoice price’ cover we could pay you the difference between the insurance company payout and the original invoice price, so for the example above £5,000. With our ‘Outstanding finance’ cover the gap insurance payment would cover any charges (up to a maximum of £10,000) that need to be paid in order to fully settle your finance agreement. Gap insurance from Audi Insurance is administered by Abraxas Insurance Administration Service Limited. Terms and conditions apply. How can I arrange Audi Gap Insurance? 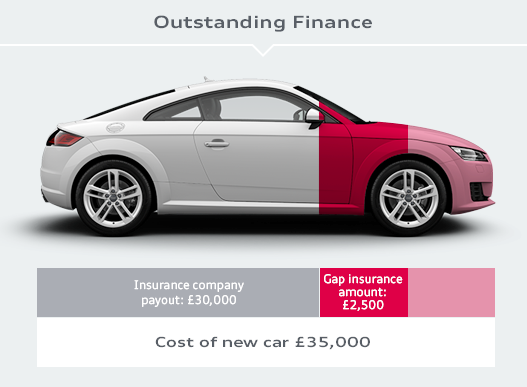 Arranging Audi Gap Insurance cover is really easy - your local centre can help you to work out which level of cover is right for you and set up your policy. To download a copy of the Audi Gap Insurance policy documents simply click on the appropriate link below. If your Audi is written off as a result of an accident or theft, your motor insurer will settle your claim based on the market value of your vehicle. This could be substantially less than you paid for it leaving you to find the money to get you back in a new Audi. Additionally where your vehicle has been financed this can leave you paying for a vehicle that you can no longer use. Our gap insurance can cover the difference between the settlement provided by your motor insurers and the amount you originally paid for your Audi, the amount still owing to your finance company, or a combination of both. How can I buy Audi Gap Insurance? 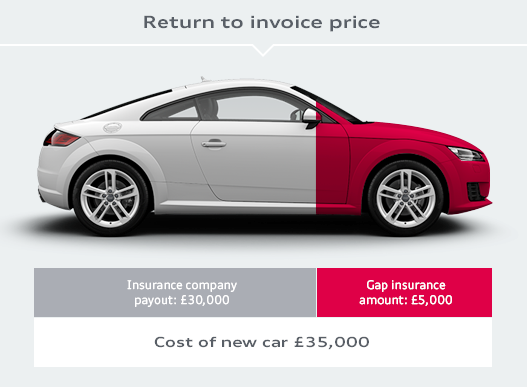 Audi Gap Insurance can be purchased from the Audi Centre you purchased your vehicle from. When can I buy Audi Gap Insurance? Your Audi Centre will be able to provide a gap insurance quote at any time before you collect your car, or up to 60 days after you have taken delivery. How much does Audi Gap Insurance cost? The cost of our gap insurance depends on the value of your vehicle. The Audi Centre that sold you your Audi can provide you with a quotation, and discuss the features and benefits of the different covers available. Does my existing car insurance policy provide any Gap Insurance? No. Whilst some motor insurers provide a replacement vehicle if yours is written off within the first 12 months of first registration, this is not gap insurance or a substitute for it. Can I transfer my Audi Gap Insurance policy to another vehicle? Where your vehicle has been written off within the first year of registration, and a new replacement vehicle provided by your motor insurers, cover can be transferred to your new Audi. Additionally in the unlikely event that there is a problem with your vehicle and this is replaced by Audi due to merchantable quality issues, cover can be transferred to the replacement vehicle. A small administration fee will apply to transfers, please see your policy or contact us for details. Please contact 0330 400 1628 and select the appropriate option from the automated message service. Please contact the Audi Centre from which you purchased your Audi Gap Insurance policy or contact the Audi Gap Insurance helpline on 0330 400 1628 to request a copy of your documentation. You can cancel your policy within the first 14 days and obtain a full refund of premium paid at no cost to you. After this cooling off period you can cancel your policy at any time, and provided no claims have been made you will be entitled to a pro rata refund.